Oh, how I love cereal boxes. I love their stability, yet ease of cutting. I love their bright colors. I love their cost… nothing! I rarely throw cereal boxes into the recycling. 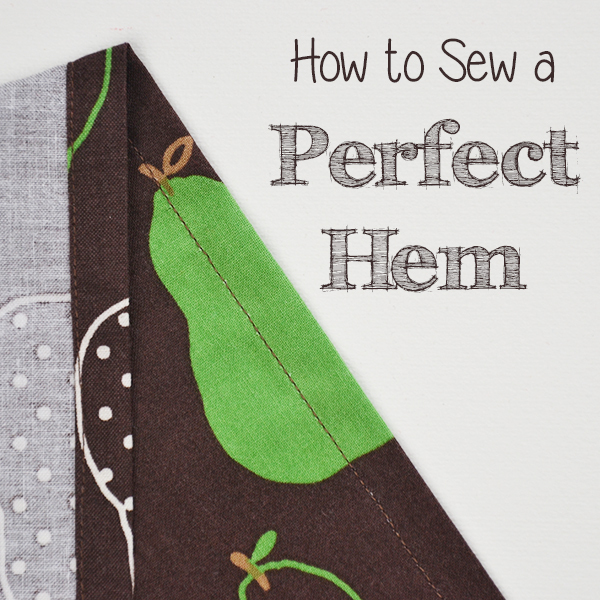 I use them to back small pattern pieces to make them more rigid and to make them last longer (and I suggest that others do so in some of my own patterns with smallish pieces). I use them for gift boxes and gift bags. I use them as mailing envelopes. 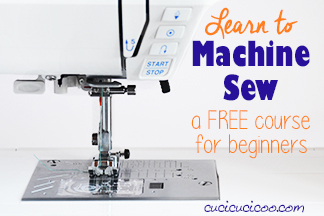 I use them to help me sew perfect hems. And when I don’t use them, my son loves drawing on them with markers. And, every so often, I make a woven paper basket from them! 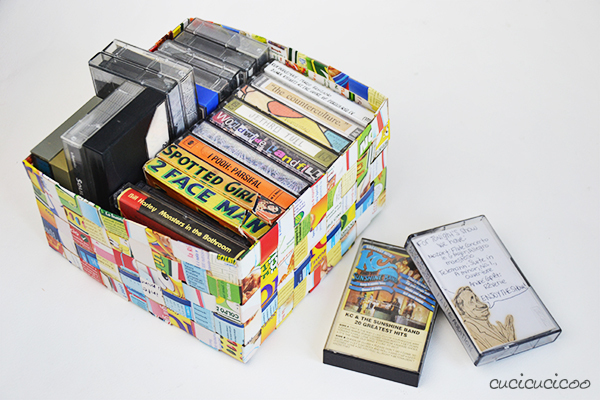 These baskets are easy to make and relatively sturdy, so they’re a perfect way to store smallish items, like your collection of mix tapes that you just can’t get rid of, even if all of your tape decks have stopped working! What a colorful and cheerful way to keep order in your home! I originally posted a very basic version of this tutorial six years ago and it has consistently been one of my most shared tutorials on websites around the globe. I’ve never been happy, however, with the photos or the instructions themselves, and so I decided to finally make a nicer and clearer version of the tutorial. I’m leaving the old tute up just because I find it pretty interesting to see just how much better my tutorial-making skills have gotten! 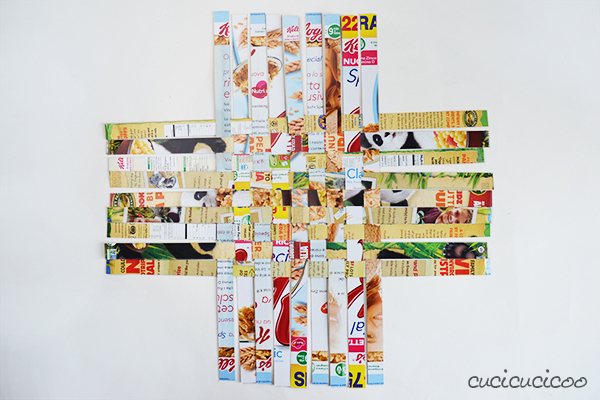 Anyway, do you have a few cereal boxes hanging around your kitchen? 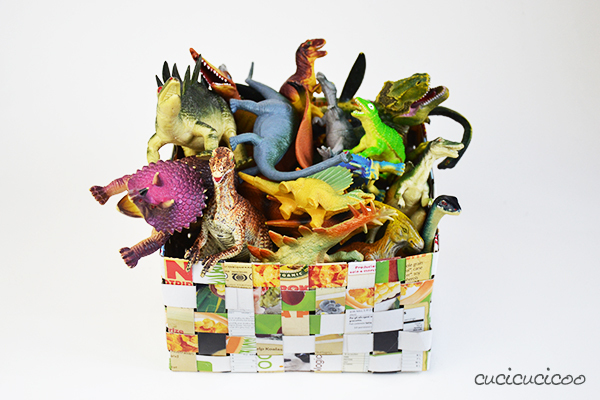 Grab them and let’s get to work turning them into DIY woven paper baskets! 1. 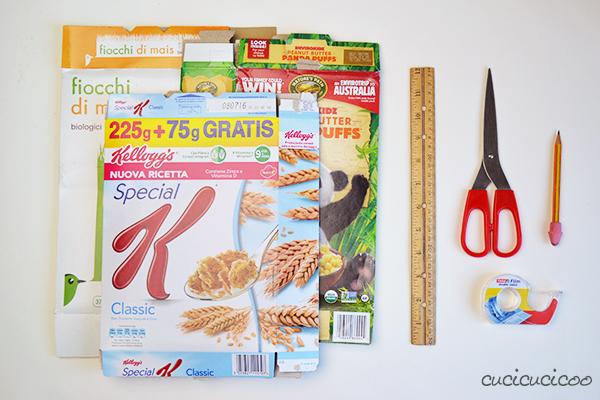 Open up the cereal box, flatten it and cut off the top and bottom flaps. Discard the flaps. 2. 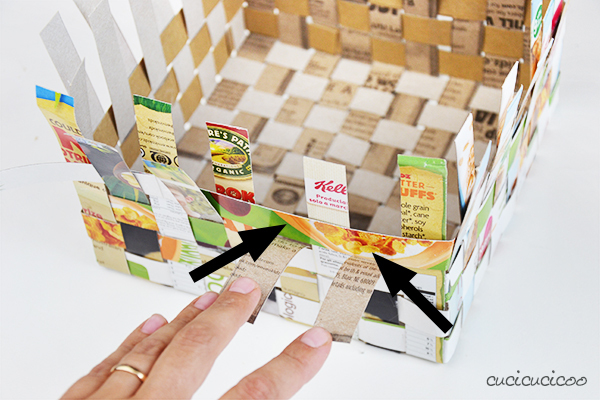 Open up the box along the glued side tab. 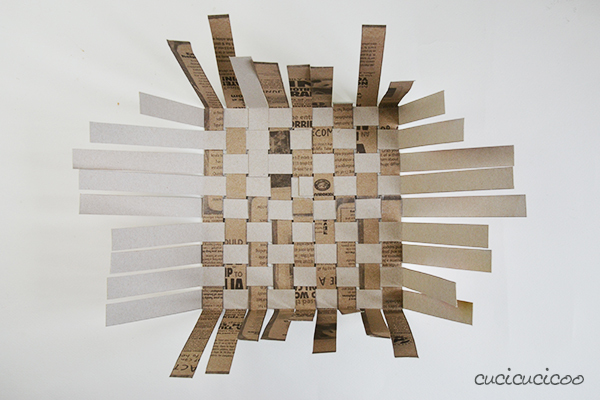 Use a ruler to draw lines 2 cm (3/4″) apart and cut along the lines to create cardboard strips. Discard portions of the box along the folds (seen at right). If you have a paper cutter with incorporated ruler*, use that to cut without measuring out the lines. 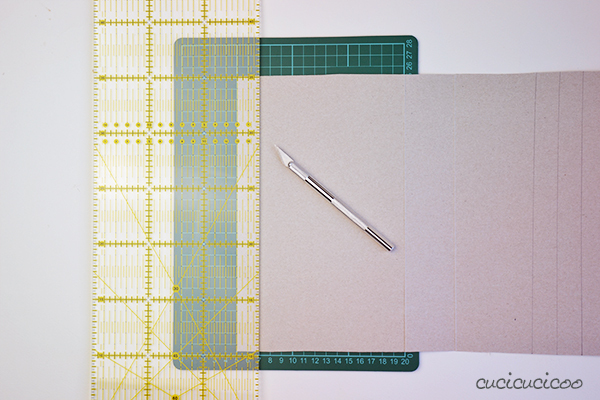 Or, if you are a sewer and have a cutting mat* and cutting ruler*, use those with an X-acto knife*, as shown above. 3. 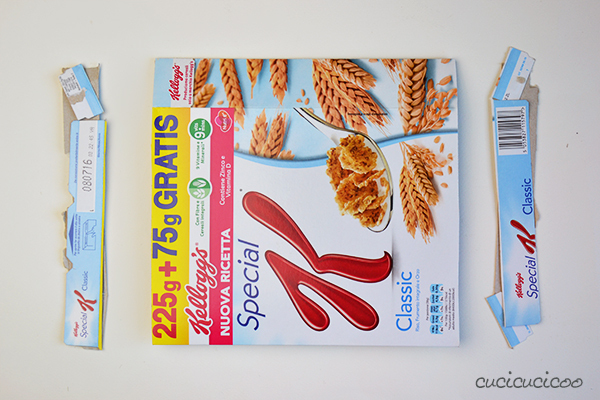 Repeat steps 1-2 with all the other two cereal boxes. 4. Now we need to make longer strips. 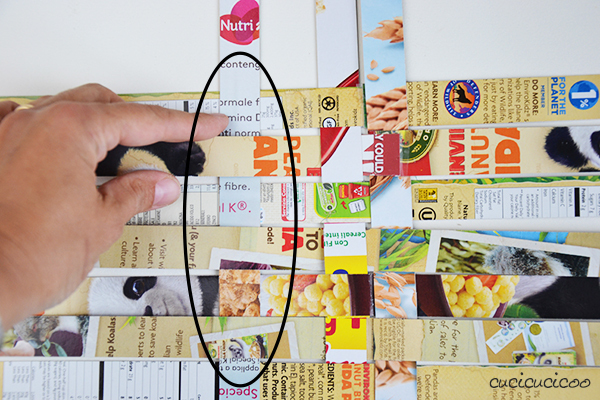 Take two strips from the same box and overlap the ends by about 1 cm (1/2″). 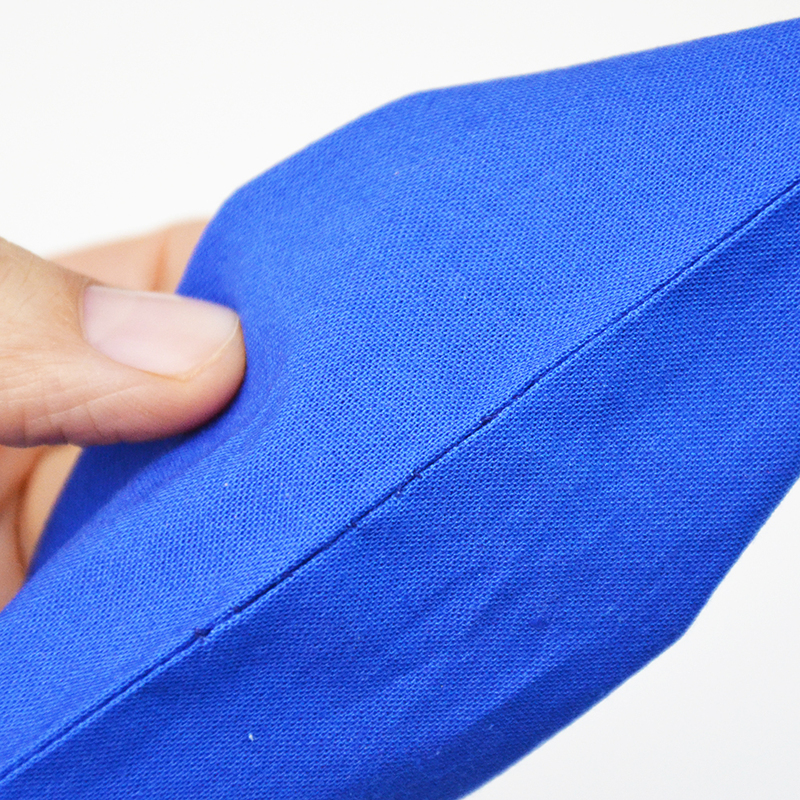 Secure the ends together with a drop of hot glue or a square of double stick tape. You need a total of 18 double-length strips. 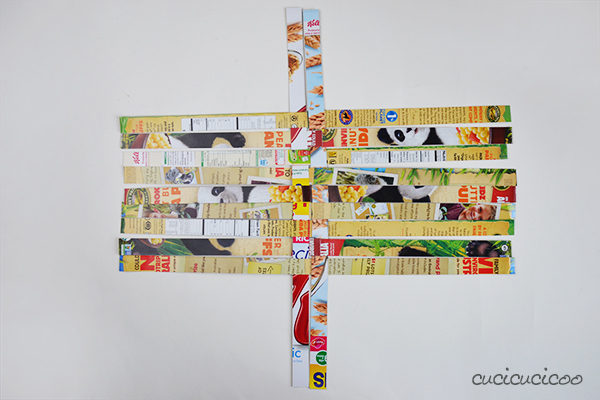 Do the same thing with 3 strips to make 6 triple-length strips. Notice that I tried to join the strips in points with similar colors and images. It’s not always possible to hide each strip joint when weaving them together, so this way they’re less noticeable. 5. Take four double strips and weave them together at their centers (where they are joined) as seen above. Each strip will go over one strip and under the next. 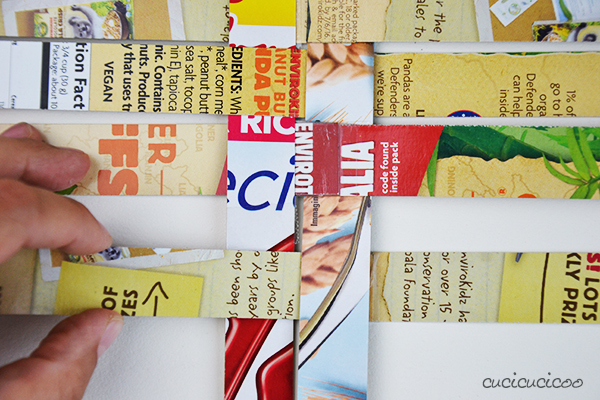 Stick them in place with a drop of hot glue or a square of double-stick tape where they overlap. 6. Slip another double strip in between the vertical strips from the top and push it gently down until it reaches the other horizontal strips in the center. Now do the same wiith another double strip, but from the bottom. *Important! * Make sure that you alternate how the strips go over and under the perpendicular strips so that the woven texture is created and the strips stay together. 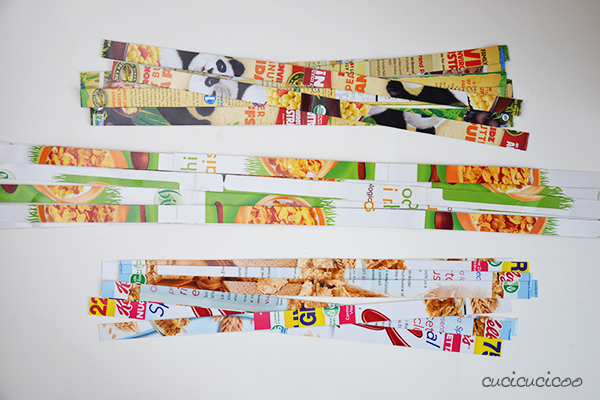 Make sure that the strips are pushed together tightly, without leaving spaces, then block them in place with a drop of hot glue or a square of double-stick tape where they overlap. I wasn’t able to do this well for this particular box because of the terrible quality double-stick tape (as I mentioned before) because the strips kept coming apart. As you can see in the later pictures, the strips ended up uneven and with spaces between them. You want to avoid this! 6. 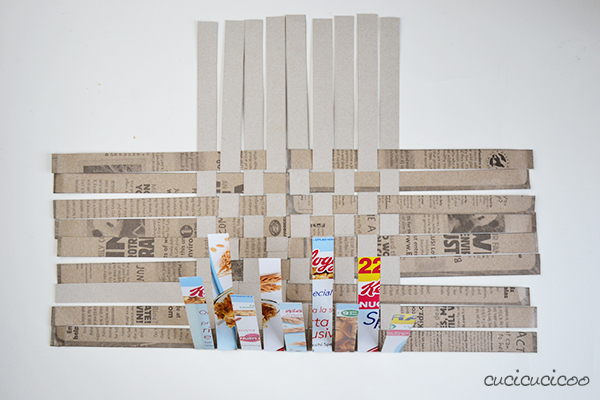 Continue adding the horizontal strips in between the vertical strips, remembering to stick each strip in place with glue or tape, until you have 9 horizontal strips in place. 7. Now let’s weave in the remaining vertical strips. Starting from the left, slip one vertical strip in, alternating the over-under pattern, as seen above. Push it gently towards the right until it reaches the other vertical strips in the center. Now do the same, but from the right. Again, remember to push the strips together tightly and block them in place with a drop of hot glue or a square of double-stick tape where they overlap. 8. Continue doing this until you have a total of nine vertical strips and nine horizontal strips. Good job! You’ve completed your woven box base! It’s already starting to look nice and colorful, right? Remember what I said about pushing the strips together tightly before glueing/taping them in place? Again, I had problems because of the crappy tape I was using, which made the strips fall apart in the middle of weaving them, so I wasn’t able to weave them tightly, and you can see how it came out quite crooked. 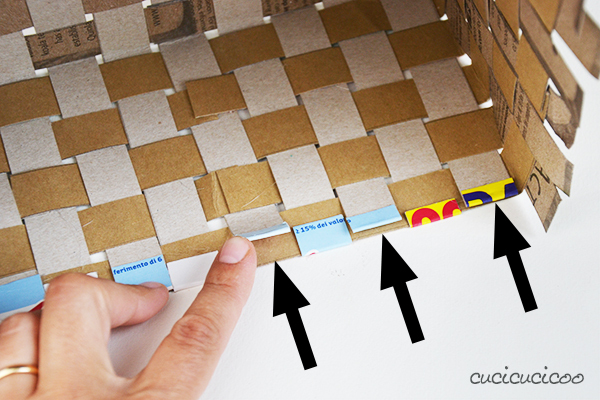 If this happens to you, don’t worry about it, because you can still complete the box, but it just won’t be quite as polished looking as if you’d woven the strips tightly. 9. Flip the woven base over, with the non-colored side facing up, and fold all the strips on one side up and over the woven center. 10. Continue folding the strips of the other three sides over the woven edges until all the straggling strips are folded over the top of the woven center, creating a square. 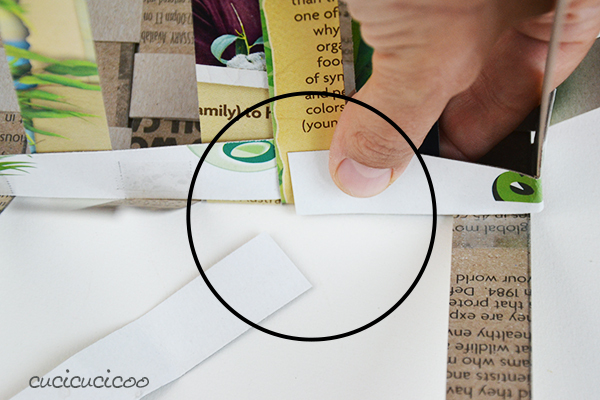 When you partially unfold the strips, it will look like the picture above. 11. This is the part that might get a little confusing, so pay attention. 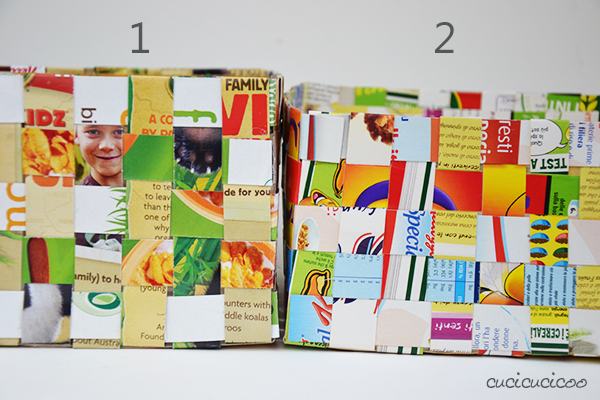 Unfold the strips on one side of the box. Look at the last woven square on the bottom left, shown above by the pink arrow (pretend that strip just below it isn’t there yet). Make sure that the vertical strip is overlapping the horizontal strip. If it’s the other way around (horizontal strip overlapping the vertical one), rotate the square so that you can work with the side either to the right or to the left, where that square is with the vertical strip on top. Fold the 2nd, 4th and 6th strips from the left back up, as seen above. 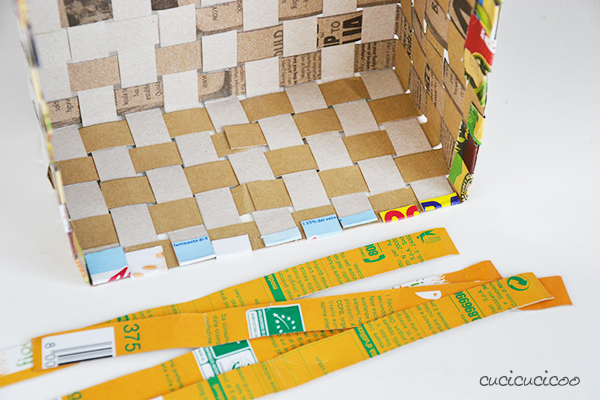 Put a drop of glue or piece of double-stick tape on the 1st, 3rd, 5th and 7th strips, close to the woven base. These points are indicated by the black arrows and red dots in the picture above. Just imagine that that horizontal strip isn’t there yet. 12. 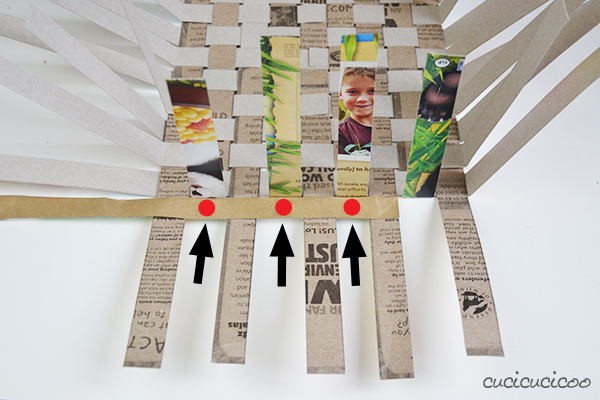 Now put a drop of glue or piece of double-stick tape on the triple strip right below the 2nd, 4th and 6th strips of the woven base, as shown by the red dots above. 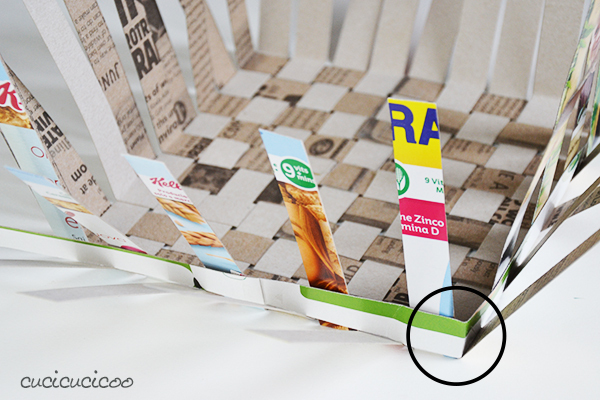 Fold up the flattened vertical strips (1st, 3rd, 5th, 7th) with the triple strip stuck to it, and press it against the other vertical strips (2nd, 4th, 6th) so that the glue/tape sticks them together, sticking up 90° from the base of the basket. 13. At the corner, fold the triple strip and continue weaving it, making sure to continue the over/under pattern as you left off from the first side. So, for this second side, the triple strip will go over the first vertical strip on the right because it had gone under the last vertical strip on the first side. 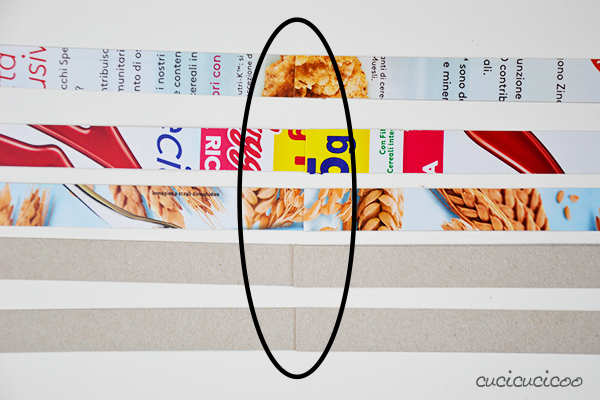 Make sure that the triple strip is pushed tightly down, without leaving spaces between the strips, and that you stick it in place with glue or tape. 14. 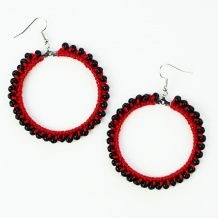 Continue all the way around the woven base until you get back to where you started. Trim the triple strip so that it ends behind the vertical strip that you started weaving from (shown above in the circle), and glue/tape it into place behind that strip so that it is hidden from the outside. 15. 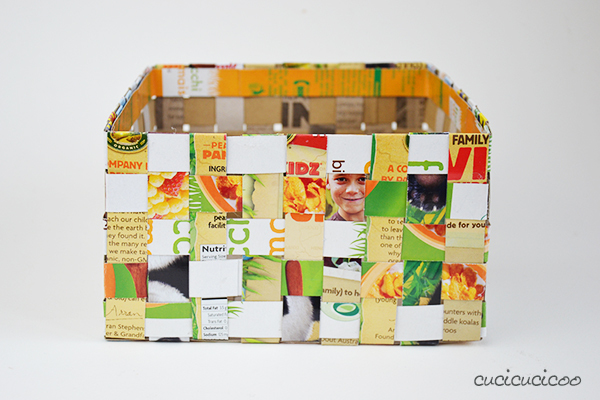 Continue weaving your way up the sides of the box with four more triple strips. After the first triple strip is in place, things get easier to figure out. Just slip each triple strip in from the top, remembering to alternate the over-under pattern compared to the strip just below it. At this point it’s not really necessary to glue every single overlapped part together. I just glued every other overlap by slightly folding over the vertical strips that go over the triple strip, putting some glue on the triple strip where they overlap (shown by the black arrows above), and pressing the strips together. 16. Stop when the box sides are five triple strips high. 17. Flip the box onto one side and fold the ends of the vertical strips inwards, over the edge of the highest triple strip. Trim the vertical strips if necessary so that they don’t go and further below that highest triple strip. 18. Glue the strips folded down in step 17 to the inside of the highest triple strip. 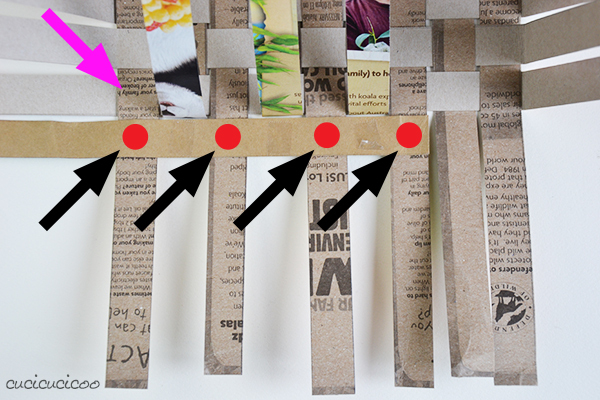 For the strips that ended inside the triple strip and therefore cannot be folded over the edge of the triple strip (shown above by the arrows), glue the folded edge down on itself, then lift the edge up and glue it onto the triple strip. Repeat steps 17-18 with the other three sides of the basket. 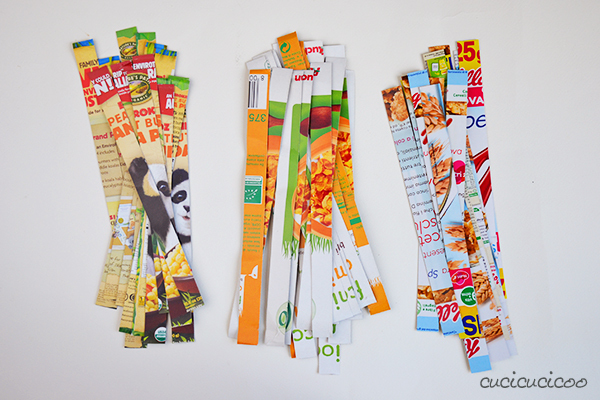 Try to use a strip made up of box pieces that look nice when put together, because this will be visible in its entirety. 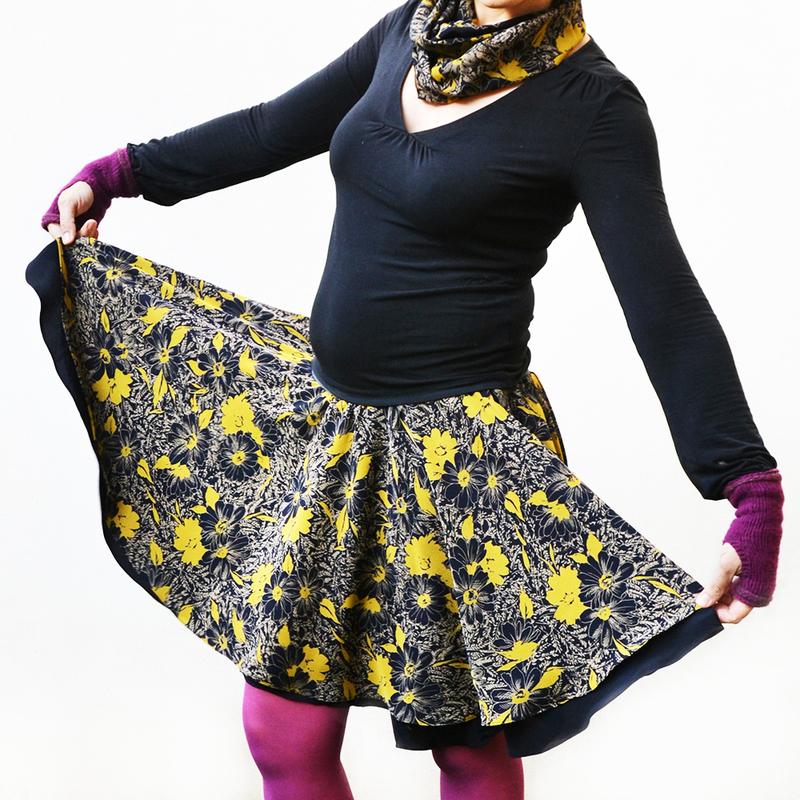 You might actually need a slightly longer strip to go around, but you can add another piece on if necessary. 20. 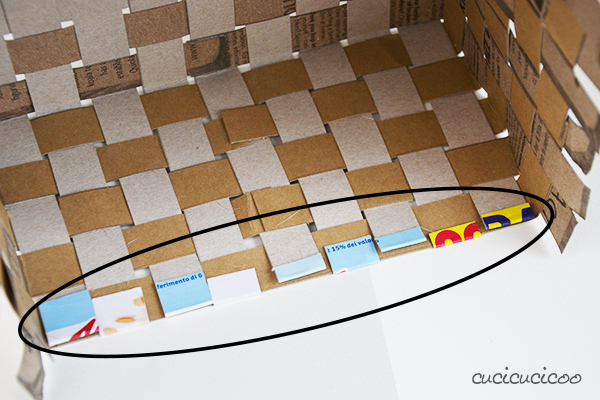 Glue the last triple strip around the inside of the box, close to the top so that it covers the folded-over vertical strips. Trim the end of this last triple strip so that it just overlaps the beginning of it. I highly suggest you paint over the entire inside and outside of the basket with Mod Podge* or diluted Elmer’s glue* and let it dry completely. 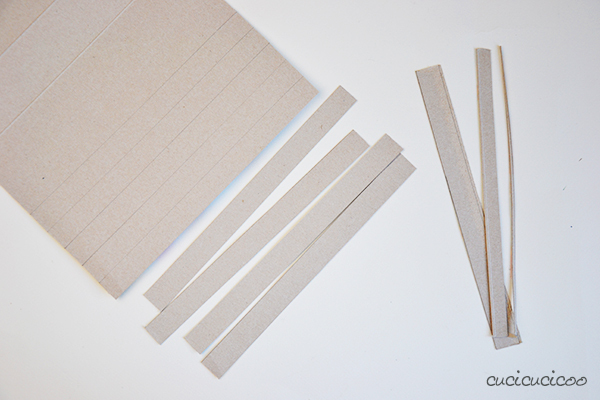 This protects the paper from water and dust, and also helps keep the pieces all together and make the whole box more sturdy. However you can skip this step if you’re in a rush or just lazy. And you’re done! It’s fun to inspect the basket to see which parts of the various cereal boxes are visible and which other parts they ended up next to. I got a good laugh when I saw that little boy peeking out at me! I know that I’ve already mentioned it numerous times, but unfortunately the bad quality double stick tape I used kept coming unstuck, which made my weaving come apart frequently. I therefore wasn’t able to slip the various strips in closely enough to each other and they ended up crooked and with a lot of spaces between each other. If you find you’re having this problem, switch to another type of hot glue or tape. You can see the difference between the loose weaving of the box in this tutorial (#1 in the picture above) and the tighter weaving of the box in my original tutorial (#2 above). 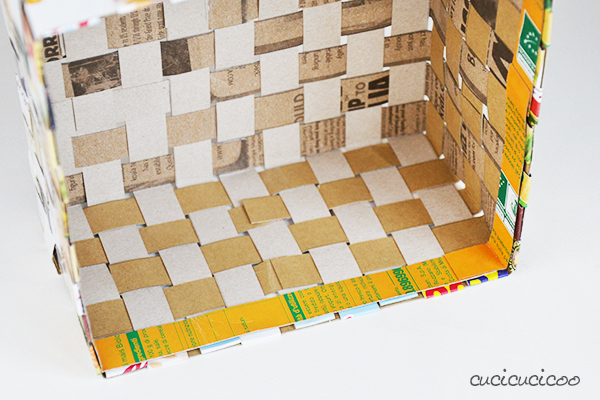 Now all that’s left to do is decide what you’re going to store inside your new woven paper basket! 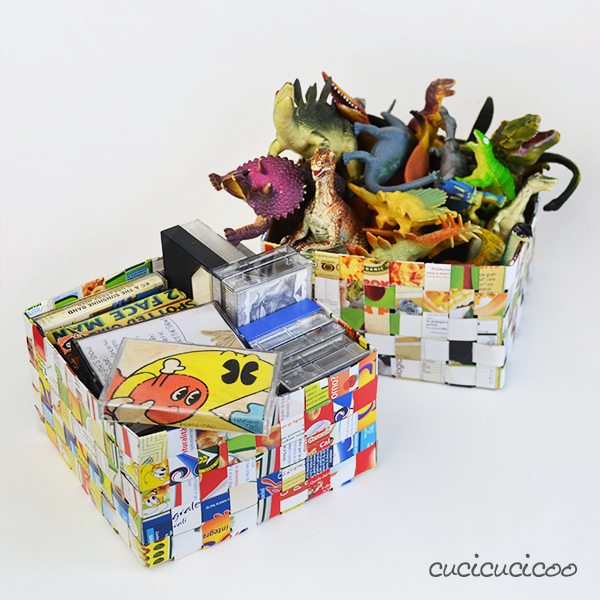 Some of my kids’ dinosaur collection lives inside the box I made for this tutorial. 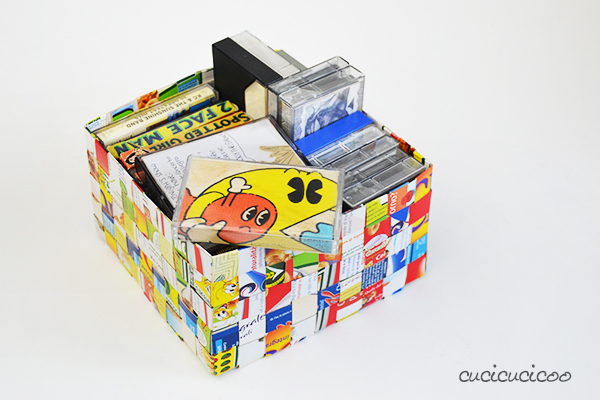 And part of my mix-tape collection still lives in the box I made for my original tutorial, just as it has since I made it six years ago! Unfortunately, all of our cassette tape players have broken, so I haven’t been listening to my old mix tapes anymore. But it was fun for me to go through them when I took it out for these pictures. I found a lot of awesome old tapes that my friends and I made. I used to love making covers using pictures, headlines and letters from magazines. Here’s one that I made back in high school. Apparently I’ve always had a bit of an obsession with being eco-friendly! An interesting aside: hardly anyone who I see or talk to these days knows that I used to be a musician. Yes! From elementary school up through the end of high school I was a band geek. I played various instruments, but I was best at the flute, which strangely enough is an instrument that I never really liked that much. Anyway, the pressure of all the competitions and lessons and practicing was too much and I quit shortly after starting college. If I had known then about beatboxing flute, I probably never would’ve stopped. If you’ve never heard it, seriously, listen to how awesome this is. I never much enjoyed Bach, to be honest, but Greg Patillo‘s version is a whole different deal! See? 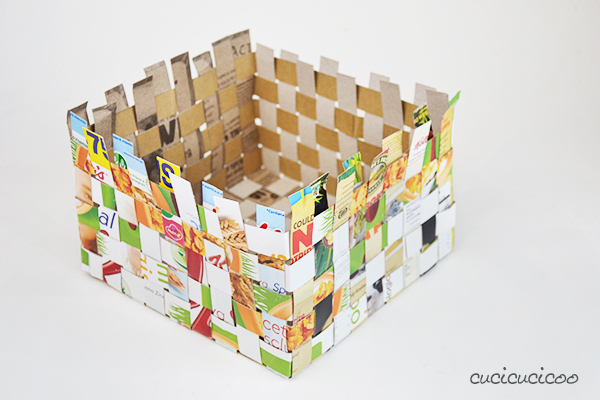 Now that you have one or two awesome woven paper baskets, you’ll have reason to get excited again about everything, from trash to music! 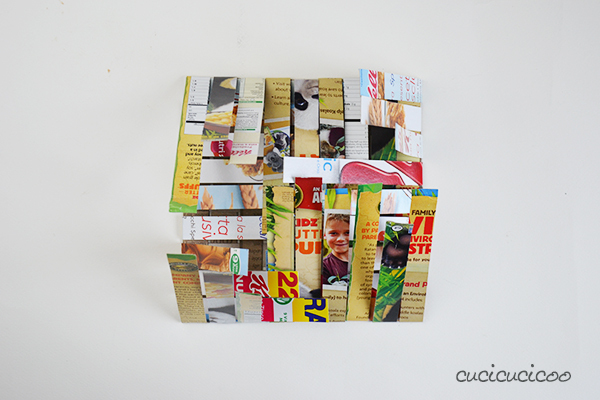 But seriously, this project is really much easier than it looks, and is a great way to make something cool and useful out of what you would normally be throwing away! Has a friend recently moved into a new home? 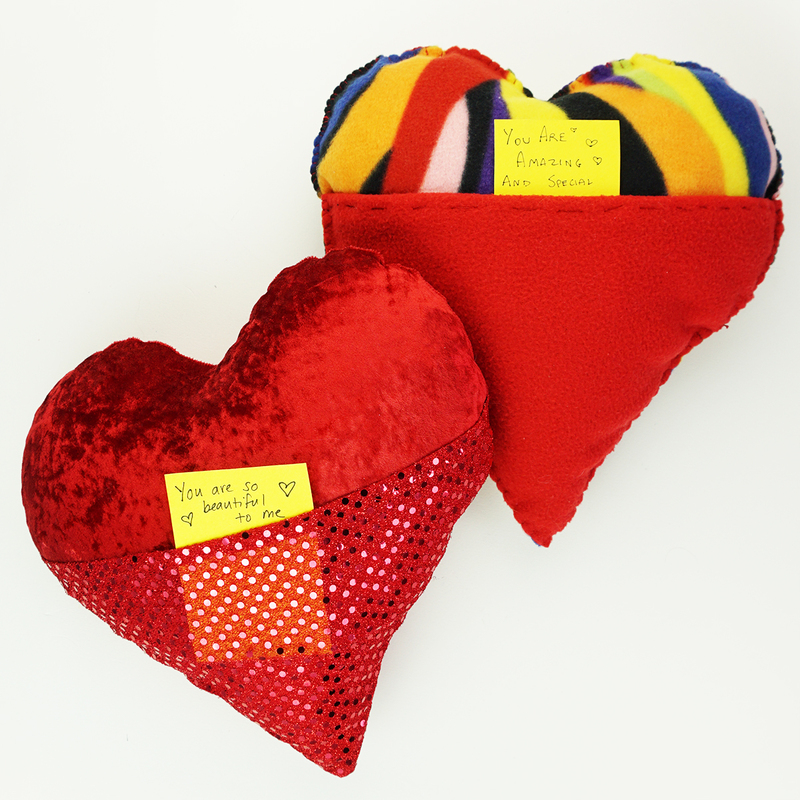 Give him or her one of these as a housewarming gift! It would be so sweet with a bag of yummy cookies inside or decorative with a nice houseplant in it! Or be selfish and just make it for yourself– after all, you can always use more baskets and containers in the house, right?! 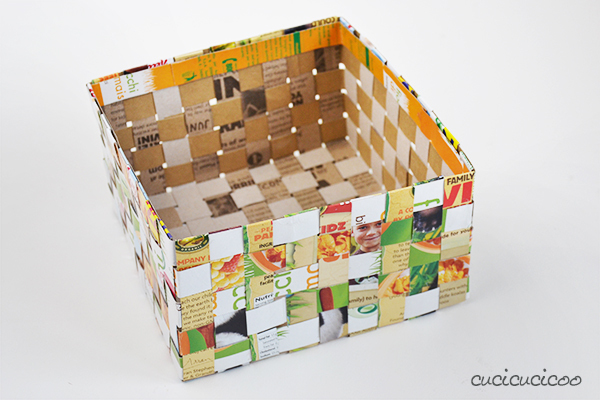 Do you love making your own baskets and other containers from upcycled materials? 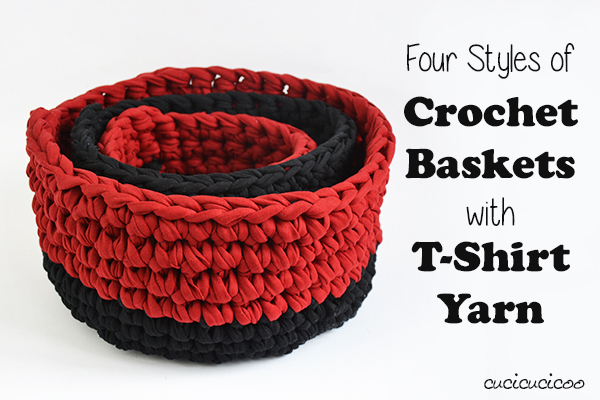 Then you need to check out these four styles of baskets made with T-shirt yarn! 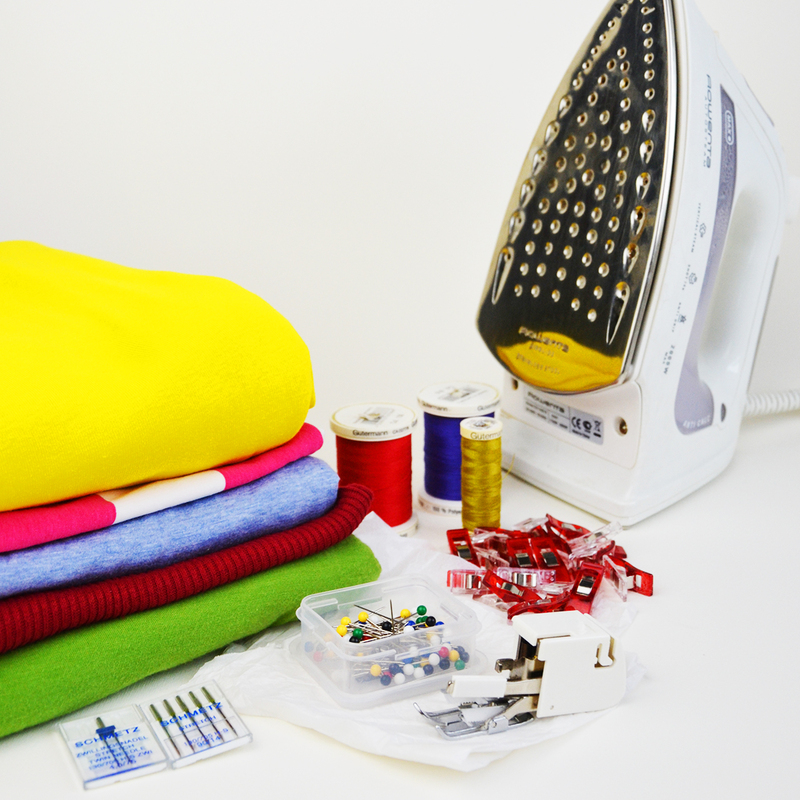 Don’t forget to sign up here for the free Cucicucicoo Newsletter for loads of great crafting and sewing ideas! 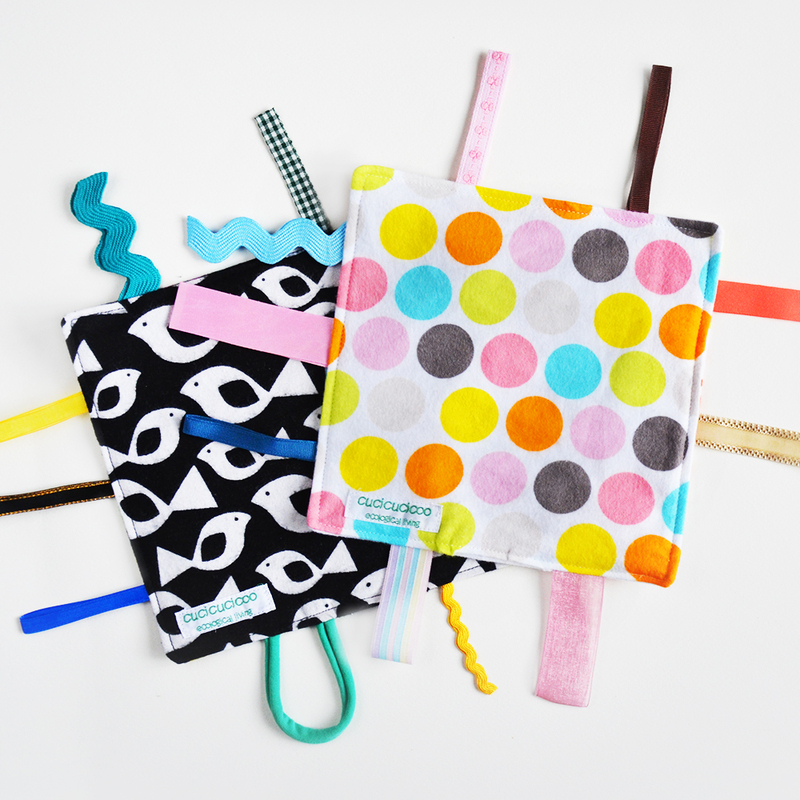 You’ll also get access to the free download library, with craft templates, sewing patterns and other useful printables! 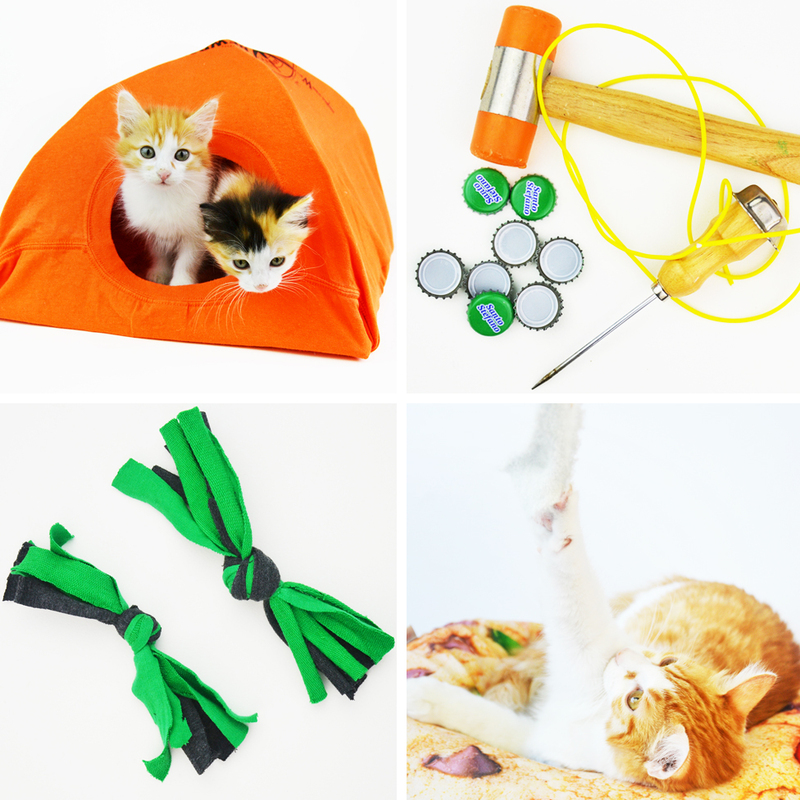 And click here to save this tutorial on Pinterest! 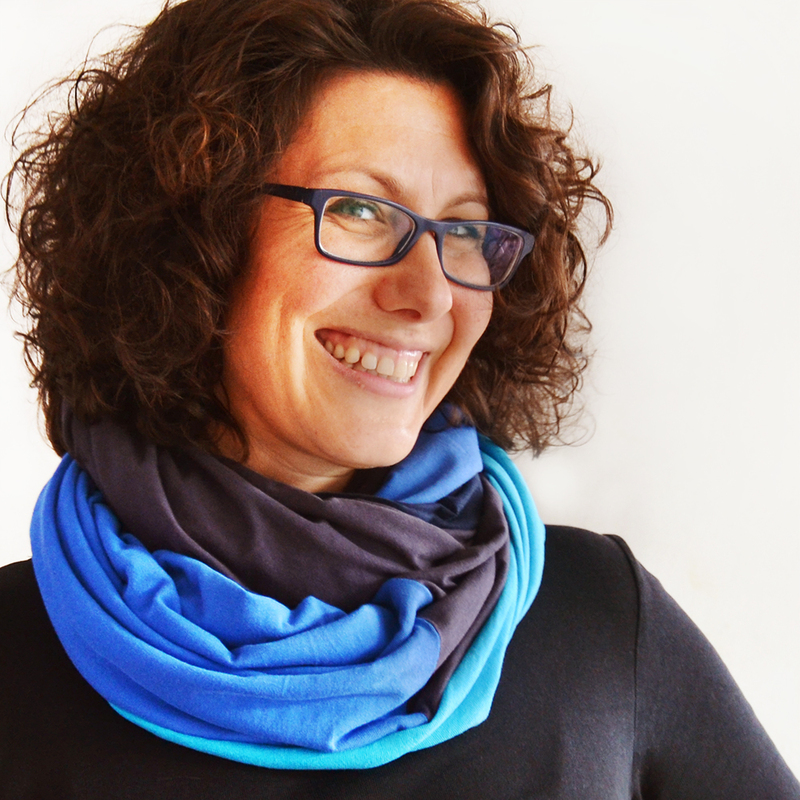 Next articleAttach elastic to a waistband – no casing or twisting! You are a woman after my crafting heart Lisa! I too have a collection of cereal boxes in my hoarding room. Haha! I love, love what you did here . But being that I am trying to move into more neutral territory I would have flipped it over and used the inside as the outside so it would look all white and taupy. The idea is excellent. And I too have a collection of tapes that I can no longer listen too. 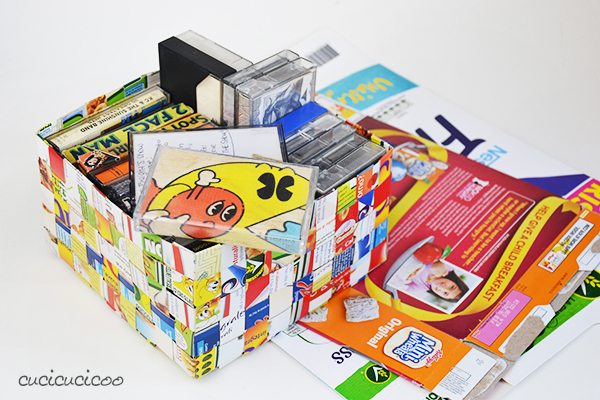 Maybe we can repurpose the tapes along with the boxes and make a table or something out of them Haha! I enjoyed the beat box version … never even knew such a thing existed. I guess we are here to learn from each other. 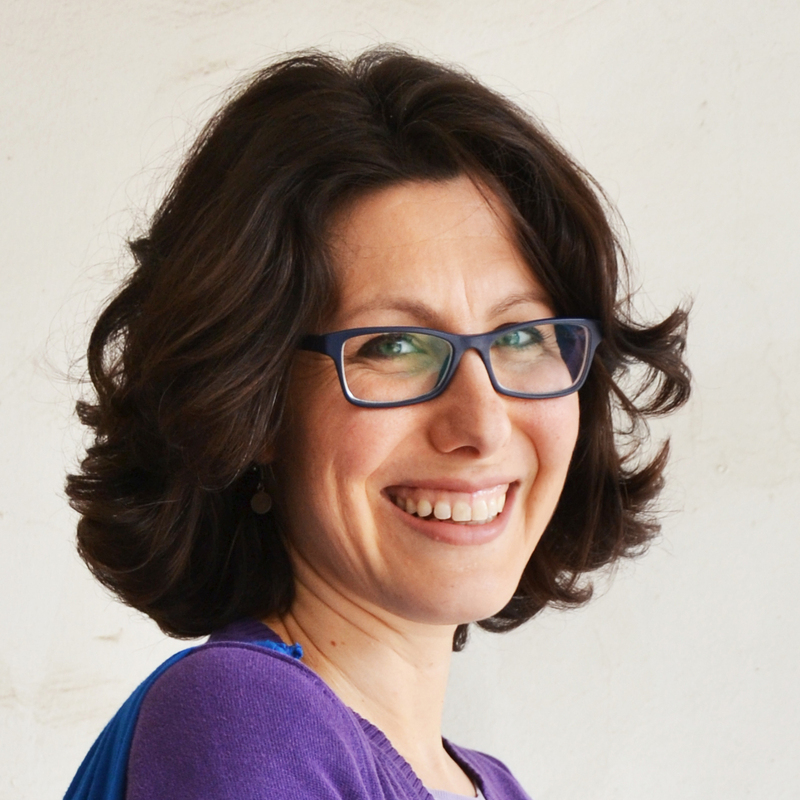 It is so nice to meet a blogger that you have so much in common with. Haha! We certainly do seem to have a lot in common, Mary! It makes me happy, too, to meet people who can understand my ways! I love bright colors, so I’m happy with the boxes the way they are, but that is definitely a good idea to use the inside non-colored part of the box for more neutral decorating needs! 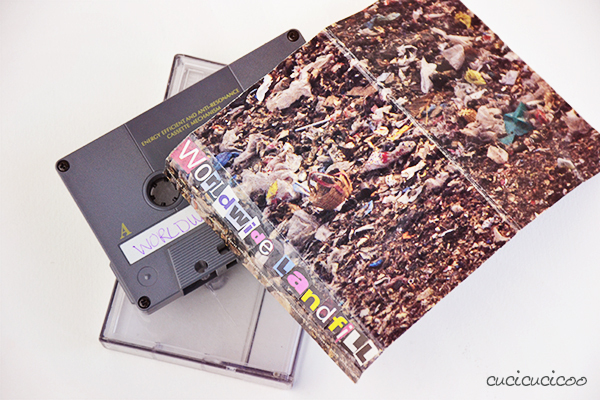 I was holding on to a ton of music and VHS tapes to crochet the tape with, but then I read that it’s actually quite unhealthy to do so, so I ended up just throwing them all away, as painful as it was to me. But there’s no way that I’m throwing away these particular tapes. I’m hoping to be able to get one of our tape decks fixed one of these days!! Very cool! I need gift boxes for the holidays, and they never seem to give them out at stores anymore! I will pin this! I’ll be saving my cereal boxes. Excellent tutorial. Thank you for sharing at Vintage Charm. Thanks, Sharon– so glad you like it! 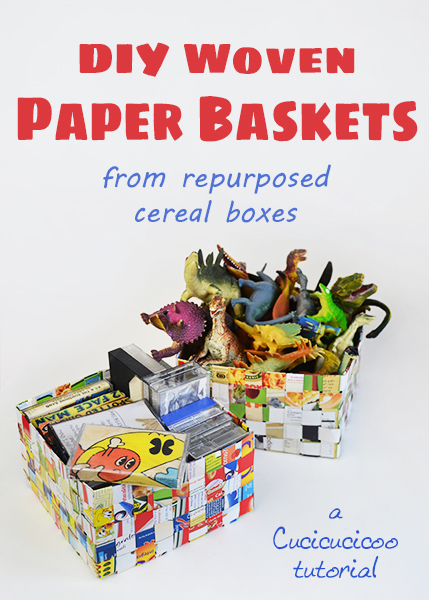 We always have cereal boxes and we can always use more storage baskets, so this is a perfect weekend project for the kids 😉 Thank you for sharing detailed and easy to follow directions. We always have loads of cereal boxes, too, Loretta! That’s why I love finding new ways to use them up! Thanks for stopping by! So glad to hear that you like it! 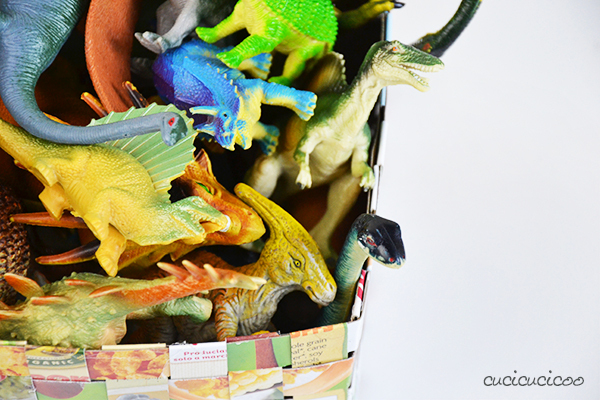 These boxes really are unique and such a fun way to organize your things!